I usually use gel and mousse on my hair as it is the only products that can tame my mane. If not it gets so frizzy, poofy big and not cute! You wouldn't be able to telI I have curls beneath the mess. Recently I wanted to go more natural/healthy so I've been trying the mixed chicks leave-in conditioner, shampoo and deep conditioner. With the summer humidity my hair is so frizzy and I want to stay away from the gel but I can't help but go back to what I know and feel comfortable with. Does anyone have any recommendations?!?! 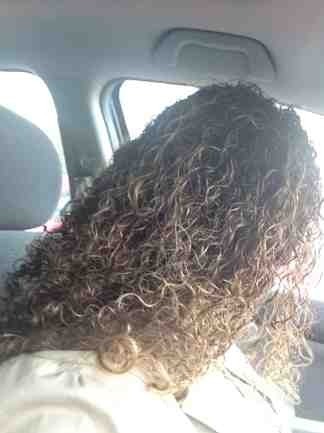 Are there any curly hair friendly gels out there or any good leave-in conditioners? I think my hair is low porosity and medium density if that helps. I live in humid city Florida lol! The onky thing that helps me is EcoStyler gel....but i am wanting to try flaxseed gel too. Thanks for the reply! I just looked up the EcoStyler gel and started reading the reviews, might have to give it a try. When using it do you have to wash your hair daily? I usually do but I am trying to get away from that. Do you use a leave-in conditioner with it or any other products? I use SM Curl Enhancing Smoothie, seal that in with coconut oil and then put the gel on top. Lately ive been re washing my hair everyday trying to avoid these dumb knots....but i dont have to re wash...usually...if u use a lighter leave in it will be a little crunchy. I let the crunch stay in and it gets softer as the days go by...i dont SOTC. Since i switched to using the smoothie...i dont get the crunch anymore like i used to. I used the Olive Oil Eco Styler for a little bit...it has great hold (coming from someone who also lives in Florida), but my only complaint would be that whenever I would try to wash it out, it felt really waxy on my wet hair. I felt like I had to cleanse my hair everyday, and I was warned against doing that. Bottom line: my hair felt dirty. When it's in dry hair, WOW. Super great hold and curl formation, but the waxy/dirty feeling really turned me off. Definitely worth a shot though! It's super cheap and works well. As for what I use now, I use AG Re:coil. Yes, it's pricey, but it's very concentrated and a little goes a long way. You can find it at Ulta I'm gonna try Curl Keeper underneath to help with frizz control. I like the Softee curl activator aloe Vera gel combined with the la looks gel. Which Mixed Chicks shampoo are you using? If it's not the sulfate-free version, that could be some or all of your problem. If you are shampooing too frequently w/a sulfate-based shampoo, it could be drying your hair out too much, despite whatever conditioner or styling products you use. That can be a real problem in humid conditions. Hair that is well-moisturized helps keep atmospheric moisture (humidity) from swelling hair strands and taking away natural curl definition. So, if you haven't tried it already, you could try co-washing or using a sulfate-free shampoo most of the time, and then only do an occasionally wash w/a sulfate-based shampoo (to remove build up). Also, do you use a LI conditioner, or do you rinse all of your conditioner out? Kiss My Face upper management gel is so good...I would definitely recommend giving it a try. Gel is the only thing that works for me. Mousse dries my hair out too much. I like Pantene's products. Good luck! Your hair is beautiful! I usually use Loreal Eversleek conditioner and this summer I've been putting some LA Looks Sports gel over it too. Sometimes I use the gel alone and it works well but than my hair doesn't feel as 'soft' as it does with the conditioner lol anyways, I'd recommend them for a try. Also, not sure if it still does but I know when I first tried mixed chicks conditioner it had a cone in it? ?